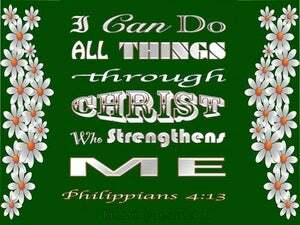 ﻿ Philippians 4:13 I can do all things through Christ which strengtheneth me. 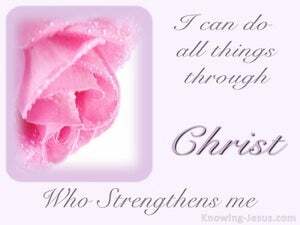 I can do all things in the Christ who strengthens me. I can do everything through Christ, who gives me the strength. I am able to do all things through Christ who strengthens me. I am able to do all things through him who gives me strength. to these things I am equal, thro' Christ who strengthens me. I can do all things through him who fills me up with dynamite. I can do anything through him who gives me strength. 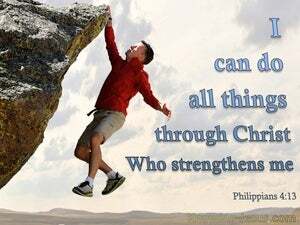 I can do all things through Christ strengthening me. 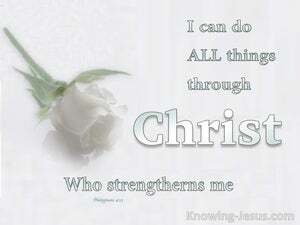 I am strong for all things in Christ strengthening me. I am able [to do] all [things] by the one who strengthens me. 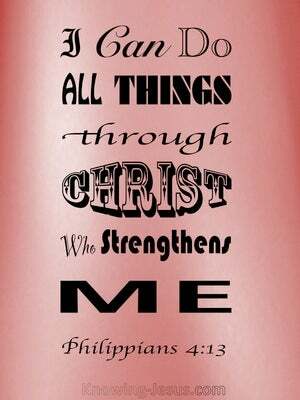 I can do all things through the help of Christ, which strengtheneth me. In him who strengthens me I am able for anything. I am strong for everything in Him who gives me strength. I can do all things in him who strengtheneth me. I endure all things with him that strengthens me. I have might, for all things, in him that empowereth me. I am enabled for all things by Christ who strengtheneth me. I can do everything in the strength of him who makes me strong! I am strong enough for all things in Him Who strengtheneth me. 12 I know both how to be abased, and I know how to abound: every where and in all things I am instructed both to be full and to be hungry, both to abound and to suffer need. 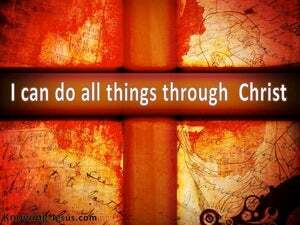 13 I can do all things through Christ which strengtheneth me. 14 Notwithstanding ye have well done, that ye did communicate with my affliction.